The medical cannabis boutique Igzactly 420 reflects its founders' roots in extreme sports. 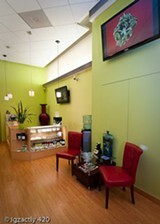 Igzactly 420 offers an upscale experience. Call them victims of the "Generation X-Games": the Boomers, Gen Xers, and Gen Yers doomed to lives of chronic pain after participating in extreme sports. For every Shaun White 540-ing out of a mammoth half-pipe, there are literally a million wannabees who will injure themselves just trying to get down the mountain. It was just a matter of time, then, before a place like Igzactly 420 opened up: a licensed medical marijuana dispensary founded by four East Coast extreme sports enthusiasts who count themselves among those who were hurt chasing speed. Situated amid the dramatic downtown skyscrapers of San Francisco, this one-year-old cannabis boutique reflects its founders' sports roots, while remaining a model of the city's dispensary regulations. This is no sketchy, converted check-cashing facility draped in bulletproof glass, notes co-founder Igor Khavin. This is not some San Diego strip mall operation, either. During a recent visit, we sat on barstools next to plush couches in the patient meeting area on the second floor of a brick loft-style building near the corner of First and Howard streets. "Eye of the Tiger" played on a heavily edited Pandora playlist as Khavin — a young guy wearing a T-shirt and baseball cap — talked about growing ganja in closets on the East Coast a few years back. He told his friends he wanted to move out West and grow legally, maybe open a dispensary. "Nobody on the East Coast believed me," he said. So Khavin came out here, went to Oaksterdam, and started growing. He had saved enough money to buy a house, and then decided to gamble it all on the long, expensive, risky process of opening a permitted dispensary. San Francisco offers a chance to operate at the highest caliber on the cutting edge of history, he said. "It's going to happen everywhere; why not go to where they set the benchmark — in the most regulated city in the world?" His three co-founders fully remodeled the place, while Khavin, who has no feeling below either shin and walks with ankle braces, handled the daunting city paperwork. Igzactly 420 received its permit in December 2010. There was no grand opening. One customer came the first day. "This is not a get-rich-quick scheme," Khavin said. The club did a little advertising, and then received a nice boost when it won the 2011 Cannabis Classic — a dispensary contest held in the spring by Orange County company Weedmaps.com. By the club's first anniversary in December 2011, it had "thousands" of patients and was continuing to see a steady increase, thanks to word-of-mouth. "We wanted to set it up as a place that's as comfortable as home," Khavin said. "If I get buzzed into a cage and have to walk through a metal detector, and I'm speaking to someone through bullet-proof glass, that doesn't feel safe." Igzactly 420 takes the subtle approach with inconspicuous cameras tracking the street and a huge metal front door artfully stained with abstract designs. Patients buzzed into the lobby find hardwood floors, pastel-green walls, and Andrew — one big ol' bouncer who doesn't take any mess. He's cool if you're cool: no slipping in the door when someone's walking out. A receptionist verifies recommendations while patients sit on Crate & Barrel furniture reading cannabis periodicals. Once you're verified, Andrew buzzes you into the dispensary proper: more hardwood floors, green walls, and designer lamps hanging from the ceiling. A rack of designer skateboards hangs near their Cannabis Classic trophy. Deeper into the club, a freaking huge aquarium full of tropical fish and coral glows next to couches and vaporizers. At three stations, wall-mounted flatscreens display a spreadsheet of 52 strains from highest price to lowest price. Igzactly 420 charges half the price of other clubs for cannabis that's often better. The dispensary works out deals with master growers and turns down trendy, overpriced strains, Khavin said. It shows in the exemplary cuts of Super Jack, Purple Kush, and various Blueberry offspring, especially the new NYC Blue — which unites the electric New York Diesel with the hazy, sweet Blue Dream. Budtenders try to match patient symptoms to strains, and Igzactly 420 gets all kinds: busted skaters with nerve damage, suited financial district types with anxiety, and a fair amount of elderly folks with a variety of symptoms. Patient donations pay for dispensary operations and reimbursements to growers. Anything left over goes into free patient services like acupuncture, career counseling, and vouchers for Yoga Tree. The club also sponsors local snowboarders through a board shop. 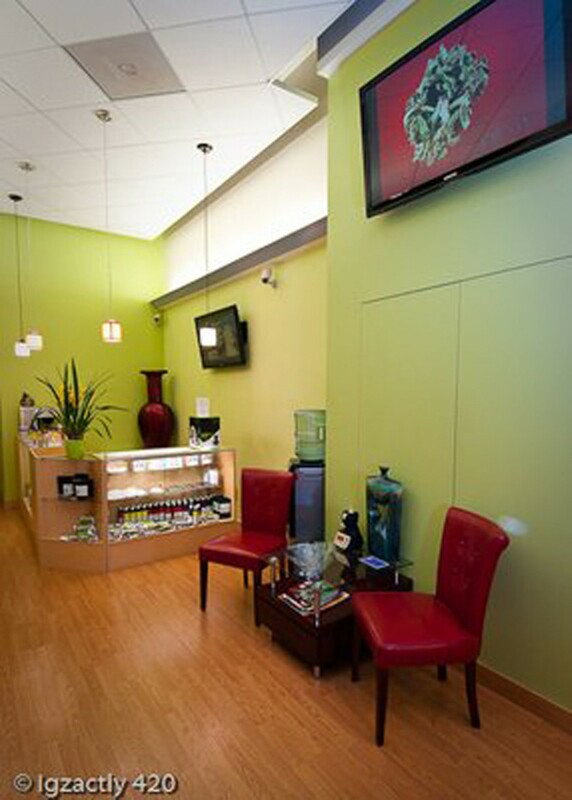 Igzactly 420, like other dispensaries, is quickly exceeding its physical capacity to provide services. So 2012 includes more permitting for an on-site lab with Oakland's CW Analytical and the conversion of potentially two more floors into meeting space. "We intend to be here as long as the community will have us," Khavin said.